I have been “dieting” for a few years with some measure of success although I tend to lose the same weight over again. I suppose I could claim that I lost a hundred pounds last year, but it was within the same 10 to 12 pound range. Still, I managed to leave 2014 8 pounds lighter than when I entered it. For the past few years I’ve been on some variation of a low fat diet, and it worked, just like any other diet, as long as you maintain it. In terms of pure weight loss, I imagine all diets are pretty equal when it comes to losing the weight. Maintaining the weight is another matter. But as virtually all diet gurus will say, you have to change your lifestyle. I think on this regard, I’ve successfully accomplished that. My cheat for that is that I’ve established a spreadsheet and I log in everything I eat based on fat grams or for this year, grams of carbohydrates. Logging your meals establishes a discipline both to monitor your food intake, and it lets you know exactly where you are going wrong. I do allow cheat days, when I don’t log at all, and that’s when the oopsies occur, but normally, the simple act of tracking keeps me on the straight and narrow food wise. This year, I’ve decided to switch things around and try low carb. What constitutes “low carb” probably can be anything from 150 carbohydrate grams per day all the way down to 25 grams. For real weight loss, you probably have to keep it down to 50 grams a day but 150 grams is probably fine for most people. I still have a few pounds to go to reach my goal weight, so for right now I’ll try to keep it down to less than 50 grams per day. Since the beginning of the year is the time when everyone hops on the resolution bandwagon, the grocery stores are thick with sales for their “healthy” frozen foods. This week, for whatever reason, it’s Lean Cuisine. 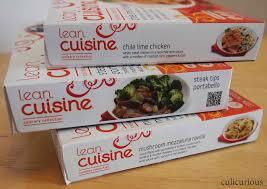 Lean Cuisine entrees’ are fairly decent all purpose meals for dieting and can be used in a wide variety of diets. It even has Weight Watcher points on the box for those who follow Weight Watchers. But when it comes to carbohydrates and sugars, you have to eyeball the each package and check the “Nutrition Facts” label. To save myself some time I decided to go ahead and pre check the Lean Cuisine entrees ahead of time so I’m not some shlub standing in front of the frozen food section with the door open too long. I made an arbitrary call to keep my meal selections to ones that were 30 grams of carbohydrates or less. That way I could eat one of these meals a day and still be able to utilize other low carb items for breakfast and dinner without going over the 50 gram limit. Having a full list ahead of time should save some time at the grocery store and it’s a pretty handy reference. We’ll see how it goes. This entry was posted in My Life and tagged carbohydrates, Health, Lean Cuisine, Low Carb Diet, Low Fat Diet, Nutrition Facts Label, Weight Loss, Weight Watchers. Bookmark the permalink. Frozen food— why isn’t your wife cooking for you?? As someone somewhat obsessed with nutrition and weight loss, I would recommend low carb as the way (weigh) to go because protein suppresses appetite. But losing weight can be so, so difficult because our bodies & brains are programmed to pack on pounds for any future food scarcity, which “unfortunately” is a nonissue for 100% of americans. Good luck, and I’m sure you look great regardless. We are our own worst critics. She does work full time and she doesn’t usually get back from work by the time I’m ready to eat. Besides, I’m not really thinking of these as total replacements for all foods, but for one meal a day. I do have other options besides these, but these prepackaged foods do offer the advantage of having already listed nutritional information. I often wonder what anyone in my house would eat if I were working full time, because cooking for everyone sure feels like a full time job. I actually have big plans this year to try a “fat head” style experiment: I’m going to lose the same ten pounds repeatedly using different weight loss methods to compare their ease and efficacy. I want to start with low carb, then try a so-called mono diet (eating only one kind of food), and I may even do the fast food diet like Tom Naughton. I don’t know if I have the willpower though– I live in the bagel capital of the world. My husband just lose 40 pounds on the Zero Belly Diet, which has the same advice. Change your eating habits. He cut out hamburgers, fast food, Mountain Dew, Twinkies, and got to drinking protein/fruit drinks. I went on the very same diet, and lost…nothing (Ha) . Of course, I don’t have a gall bladder. I’ll try those Lean Cuisine. I’m getting tired of drinking my meals in a cup. Easier said than done, however eating habits are not changed in a day. Even gradual changes can pay off long term.